When I think back to this past month, it was one big blur. 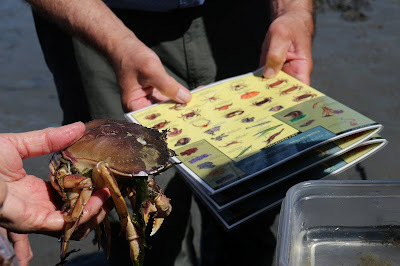 It was as if my whole month of work just melded together into one big pot of marine science education. It is hard to explain, but I know I taught schools groups, led tours, ran the exhibits, but it feels like it happened so long ago! Then, as if May wasn't big enough, a HUGE opportunity fell into our laps, and we just couldn't say no. I'm sure most of you already know what I am about to say, but in the middle of the craziness that was May, the Port Townsend Marine Science Center acquired another full Grey Whale skeleton (the gray whale in our possession now is used for our Whales of the Salish Sea classes). I have been waiting for an experience like this to happen again. The first necropsy I ever did was on a Sperm Whale four years ago in Bar Harbor, Maine. I didn't know when/if I would ever get to take part in a large whale necropsy after that, but luckily, I did. It was a hectic but exciting week where we were just about completely consumed with dealing with this whale. And let me tell you, dealing with a 30 ft. Grey Whale with only a week to plan is no easy job. But we were successful! A group of about 25 people spent 8.5 hours cutting up, wrapping and then sinking the whale. By the end we were all exhausted and smelled horrible — my watch and two pairs of rain boots still have a faint smell of decomposing whale. It is still hard to truly comprehend what happened. Below I have added some pictures from what has become affectionately known as Operation Burrito Whale. If you want to have further details, check out the article that appeared in the Port Townsend Leader last week! Megan dabs essential oils under her nose. This will only partially mask the smell of the whale. Our knives became dull very quickly. there were always knives to sharpen. or dealing with the net, they were helping out. about and hour to get just one out! It took three people to get the scapula and fin out. None of this would have been able to happen without the knowledge, resources and help from different organizations. So a BIG thank you goes out to NOAA Fisheries, the U.S. Navy, Washington Deparment of Fish and Wildlife Marine Mammal Investigation, Cascadia Research Collective, the MaST Center, Dr. Pete Schroeder, Washington Department of Fish and Wildlife Enforcement, Washington State Parks, Washington Department of Natural Resources, U.S. Coast Guard, Orca Network, Seattle Aquarium and the Sea Doc Society. And of course, a big thank you goes out to all of the wonderful volunteers and staff who took time out of their normal schedule to help out. Wade C, Sue L, Megan A, Mallory W, Michael T, Merce D, Stewart P, Howard T, Ashley M, Rebecca M, Carolyn W, Zofia K, Amy J, Karlisa C, Betsy C, Janine D, Alison R, and Phil D.
Don't forget to join us this Saturday, June 4, at 9 am for a guided low tide walk! 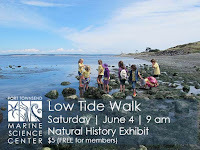 We're expecting to have great weather, so if you haven't ever participated in one of PTMSC's low tide walks, this would be a great weekend to grab your brand-new PTMSC hat and come out to explore! During the last week of April, students from across Washington state gathered at Fort Worden for WaterWorld, a week-long arts and science camp run by Centrum in collaboration with the Port Townsend Marine Science Center. The week is filled with art, dance, and writing activities, as well as science classes taught by Science Center staff. Our role was to help students understand how marine and terrestrial habitats are connected by watersheds. 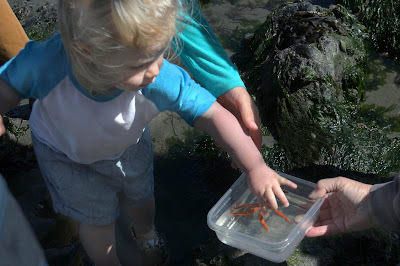 The highlight of the week-long camp was Expedition Day, where campers journeyed through the forest, across meadows, and along the beach to discover the variety of aquatic habitats in and around Fort Worden. Sightings included bald eagles, tadpoles, seals, and crabs. After identifying and learning about the animals they had seen, some students paused to draw or write about their expedition day discoveries. All students participated in a showcase at the end of the week, where they presented skits, poems, dances, and the artistic journals they produced in class and on the expedition. How many animals can fit under a rock? I enjoyed the opportunity to share both my love of science and art with many different campers and seeing their enjoyment of relating their experience in the natural world using artistic mediums was incredibly rewarding. Art is a wonderful way to reach new audiences and to help inspire a lifelong wonder at the world around us, and I am always glad to include it in science education. Learn more about WaterWorld and see more photos. On Saturday, twenty-five people came down for a low tide walk at Kinzie Beach on a warm, blue-sky morning. Spreading out among the rocks, kelp, and seagrasses, visitors discovered shaggy mouse nudibranchs, gumboot chitons, blood stars, anemones, hermit crabs, sea worms, giant barnacles, limpets, and even a snailfish, named for its tail which folds inward like a snail shell when the fish is resting. Last Tuesday and Wednesday, 128 people participated in our GiveBIG campaign, a 42% increase in participants over last year! Donations ranged from $10 to $2,500 and came from as far away as Vermont! Thank you all for coming together to collectively make a huge impact. We are happy to report that we surpassed our goal of $15,000, raising a total of $20,625! 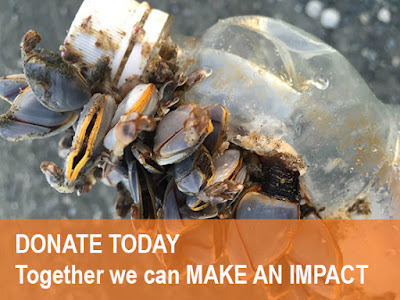 We are thrilled with this 19% increase over last year — a new GiveBIG record for the Port Townsend Marine Science Center — and are humbled and honored by your support. Every weekend, squeals and laughter echo through our exhibits and touch tanks as our volunteer docents tell the story of our orca, Hope, and help visitors connect their own lives and choices with the health and conservation of the Salish Sea. Whether seeing a child touch the incredibly soft fur of a seal for the first time or wriggle with excitement as their finger is delicately "hugged" by a sea urchin, our volunteers help create small moments of inspiration almost daily. Those moments can shape a lifetime. Yesterday, we welcomed a group of 80 second-grade students from Sand Hill Elementary School for a tour of our Marine Exhibit. One unanticipated highlight of the tour was a tank filled with seawater (and nothing else), which we had goofily named "the plankton tank." Upon discovering that seawater is filled with billions of plankton, one student asked for permission to uncover the tank so he could "please touch all the plankton." Students excitedly took turns dunking their hands into the sea water and looking at plankton under a microscope. One student expressed fear of having to leave before she got a chance to look at plankton under the microscope because, she said, "plankton are the coolest dudes ever!" The students were more hyped about the plankton than anything else, which is a marine exhibit first. When asked how the water in the "plankton tank" felt, one student exclaimed, "Oh my goodness! It feels like I'm being tickled by a billion tiny creatures!" Needless to say, the "plankton tank" was a total Sand Hill Elementary hit. Thank you to all our members, donors, volunteers, students, and friends for making this past week such a success at the Marine Science Center. 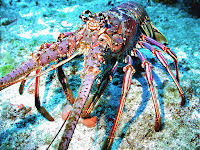 JOIN US AT OUR ANNUAL MEETING Thursday, May 26 from 5:00 to 6:30 for a recap of the Science Center's highlights and successes over the past year as well as a lecture presentation from new Program Director Karlisa Callwood on the Caribbean spiny lobster.